Like the rumbling of a jet on takeoff from SFO, the sound of discontent can be heard throughout South San Francisco, but are our City officials listening? 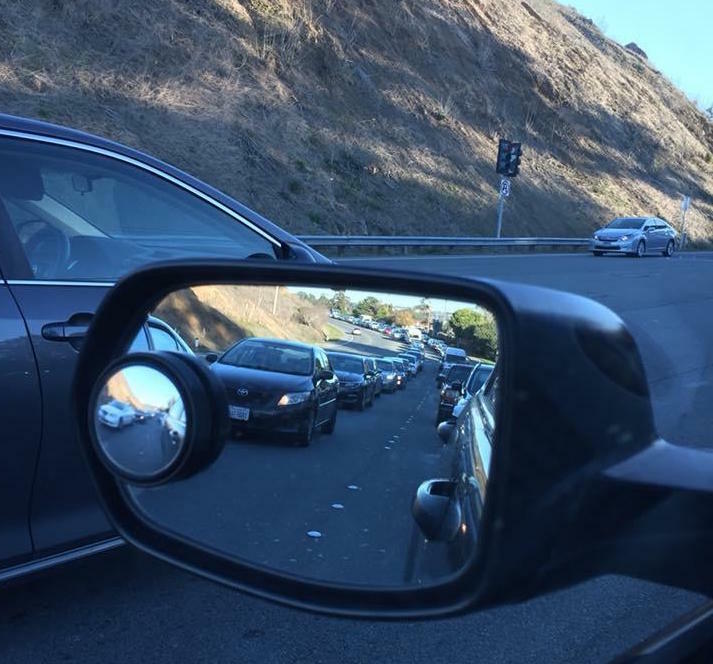 The grumbling is emanating from longtime residents who are tired of their concerns being ignored by City planners and Councilmembers, and by the increasing numbers of biotech commuters stuck in traffic jams as they try to make there way to the burgeoning biotech community east of 101. The source of all this exasperation is, of course, the two issues facing not only our City, but the Bay Area, and the State of California as a whole: Housing and Traffic. Its understood that these issues are regional and involve dynamics such as housing supply and demand, that can’t possibly be solved on a local basis only. But we as a City, in the form of our elected and appointed officials, can and must take a realistic look at our situation and at the very least, not exacerbate an already difficult problem by continued unrestrained growth and development. 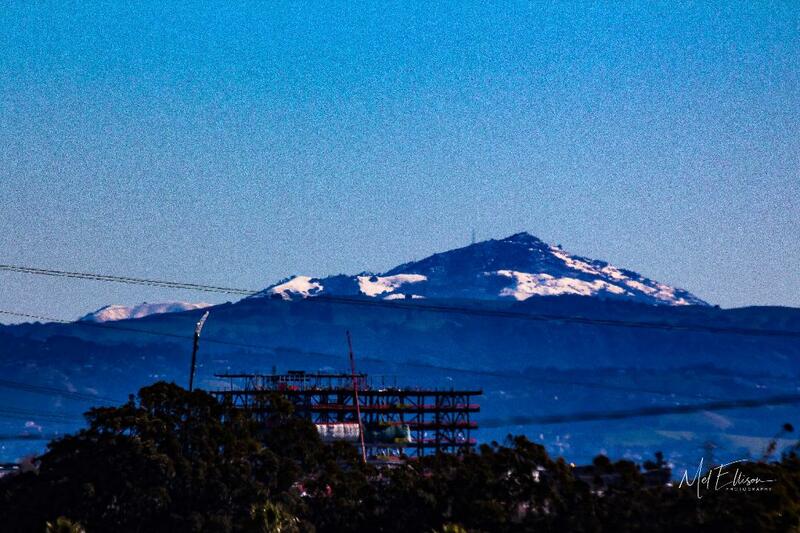 Daily, from my study window, as I enjoy my morning coffee, I look out over Oyster Point and see the cranes and skeletons of new biotech construction rising up and beginning to blot out my view of Mt Diablo to the east. 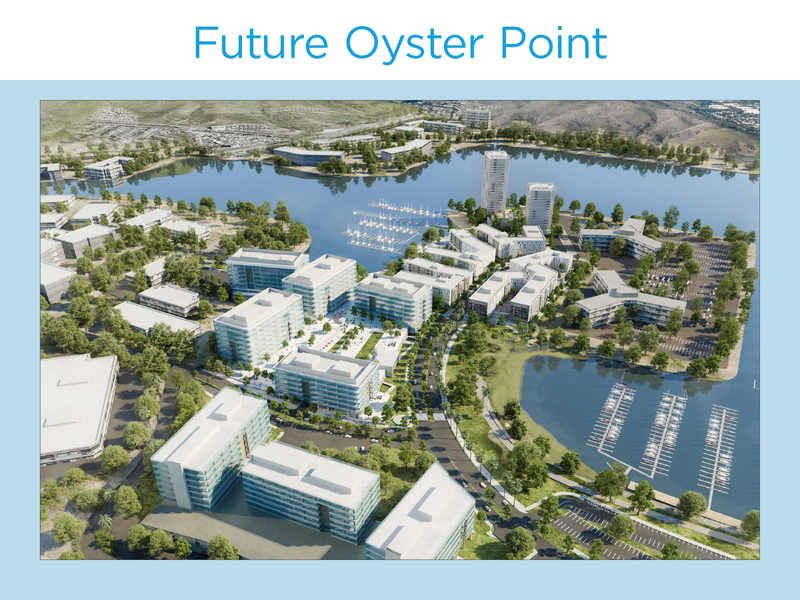 As if all the existing traffic congestion and housing woes aren’t already enough, City officials have given the go-ahead for even more construction with the approval of a deal with Greenland USA….a China based company that was ardently courted by our City officials….to develop some 80 acres of Bay front land in Oyster Point. 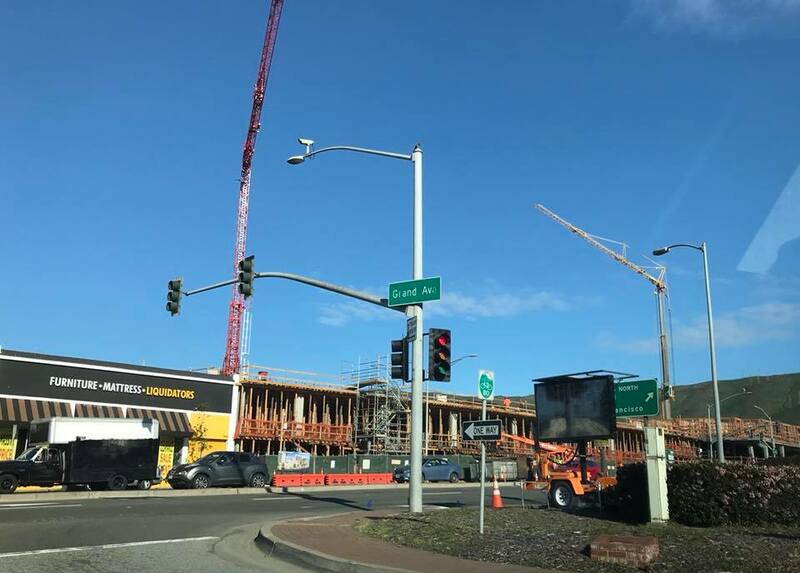 A development vehemently opposed by the biotech company that started it all, Genentech, because of…what else?….the increased traffic congestion it will bring. Our City planners have a lamentable history of not following through on agreed maintenance after developments are completed. After a taxpayer funded study found that noise and air pollution from the developments on Hillside/Sister Cities Blvds were harmful to residents and that trees lining surrounding streets would help mitigate these negative effects, ten years later only one block of reforestation has been (just recently) completed. This after even more developments have been approved and constructed over that time. On the other hand, if you listen to the PR from Greenland USA, you would think they are building some sort of Utopia east of 101 that is going to solve all of South City’s housing and traffic problems. 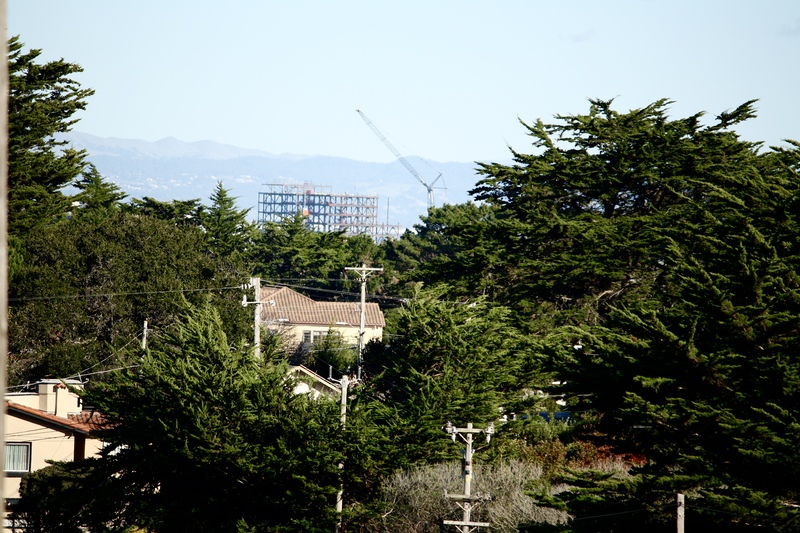 Acres of new biotech space are being constructed along with a housing development. If we were to believe Greenland USA, all of the old and new employees of Oyster Point biotech companies are going live in this new housing and bicycle to work, thereby magically solving not only our current traffic congestion and housing problems, but those problems when magnified after construction of millions more square feet of new office and R & D space. It should be noted that the current driving force behind the City’s recent downtown development and biotech expansion is in part due to City Manager Mike Futrell. Arriving here three years ago from his native Lousianna, Mr. Futrell had no roots or other connections to SSF prior to accepting the job as City Manager. Although he has addressed quality of life issues during his tenure, reinforcing South City’s place as the world’s renown biotech center seems to be his main focus, as he seeks to move upward. Meanwhile, where is our City council on all of this? On January 11, 2018, the City Council met in a yearly Special Meeting, referred to as a “retreat”, where topics of importance to the City are discussed. Issues from the past year as well as issues that need to be addressed in the coming year comprise the meetings agenda. So what is literally topic #1 of the meeting’s agenda? “Parking, U-turns, and Pedestrian Safety” which is as close as the Council ever came to discussing the traffic congestion that roils our streets and highways during commute hours every weekday. According to the minutes of the meeting, the Council discussed…at length, mind you…. traffic congestion on Grand Ave especially during the hours of 11:00 am and 1:00 pm, and on weekends. Many solutions were put forth for this apparently pressing problem including, but not limited to, bollards down the middle of the street, restriping, stricter enforcement, and from the Department of Public Works director Kim, the notion that longterm improvements to “streetscaping” would eventually solve most of the issues at hand. 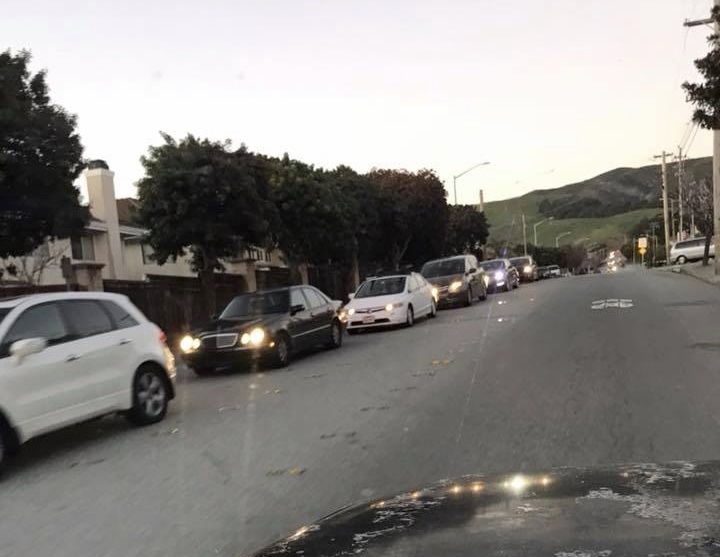 I wonder if longterm improvements to streetscaping would solve the crushing traffic problems experienced weekdays on Hillside Blvd and other roads leading to and from Oyster Point during commute? But we’re apparently not to worry about solutions to the existing commute traffic nightmare or any plan or vision for the increased traffic from the new development in the future either…..the Council’s discussion of traffic at this meeting never left Grand Ave.
Hillside Blvd traffic routinely backs up west of Chestnut Blvd to Hwy 101 with more heavy traffic to grow as the ‘Biotech’ hub continues to grow. “How does this enhance Quality of Life?” residents are asking. Side streets are now becoming congested as drivers seek to bypass this traffic burden. Another one of the topics on the Special Meeting agenda concerned a study by Godbe Research commissioned by the Council regarding resident satisfaction. 471 residents were interviewed and the most important issues to residents according to this study were….you guessed it….housing and traffic congestion! It’s important to reiterate that none of the agenda topics at this City council Special Meeting concerned our pressing housing and traffic problems. Why? I did notice that one of the first items in the minutes of the Special Meeting, under the heading of PUBLIC COMMENTS, is the phrase “comments are limited to items on the Special Meeting Agenda.” I would expect that if the Council’s agenda did include the hot-button topics of housing and traffic, the SSF residents would have given them an earful. But by not being part of the agenda, that problem was “solved”. “I was called. They didn’t ask us about traffic, the over building of our small town, and the lifers on the council. Everyone knows polling asks questions to what they know the answers before asking. We weren’t asked that we think about all the windfall of money, the parks are a disgrace for a small town. WE didn’t vote for a ‘civic center’ with an expensive fire house(that is not needed). Measure W passed because they changed the rules and the wording in the ballot statement. Current traffic, especially during ‘commute hours’ extends from Miller Ave down Chestnut Blvd to El Camino Real as shown in this photo. 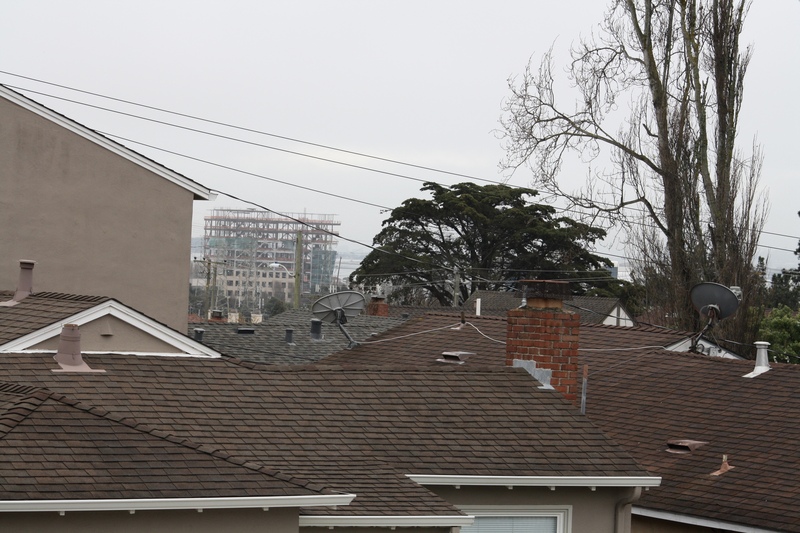 As the City plows ahead with new construction the saddest aspect is the apparent disregard for what has made SSF a great place to buy a home and raise a family. A place where we take pride in our neighborhoods, and appreciate the small independent stores like the now closing Bronstein Music and in time, South City Car Wash. These small businesses are more than just stores but are part of our extended family….part of the fabric of life that makes SSF a great place to live. Yes, change is inevitable and a part of life. But not all things of the past need to be crushed and disposed of. It might be time to step back, take a deep breath….put aside for a moment the windfall of new taxes in the City coffers from all the shiny new biotech buildings….and for once really consider the quality of life here in SSF. Sure, the traffic and housing concerns are regional, but big changes can and do begin locally. If we decide as a city to make quality of life the number one priority instead of the prestige of being a biotech center, everything will sort itself out including the City’s place in the biotech world. 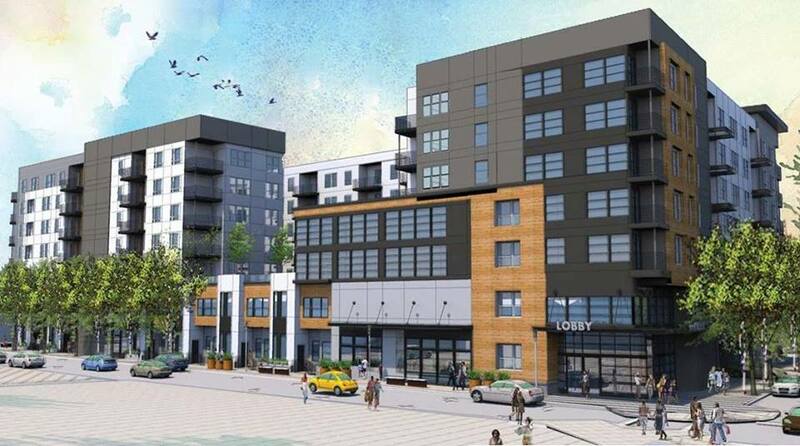 The old Ford buildings on Airport will be replaced with high rises on multiple blocks in the downtown area. “The city planners have overseen a great destruction of our downtown cohesion, and have solidified an enormous wasted opportunity. We could have built on what was wonderful and historic, developing our unique charm into an absolutely appealing little niche area, which would have been the envy of many towns around us. Instead, we have a great wall of tastelesness and incongruity which have both dwarfed and rendered extinct all opportunity for a beautiful footing to our downtown area. 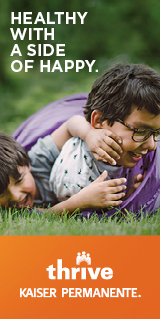 For more on local development from Everything South City CLICK HERE. To view City wide construction updates CLICK HERE. To read the minutes of the Council retreat CLICK HERE. Mel Ellison is a free-lance writer and photographer who covers special features for Everything South City as well as taking the role of co-admin on our social media. 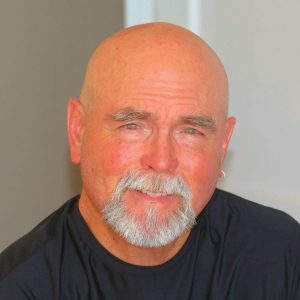 Married to Lynn Brunetti, they enjoy family time with their grandchildren and enjoying their Brentwood neighborhood in South San Francisco. When not dazzling us with his photography you will find Mel on the open seas pursuing his love of sailing. He is also an accomplished musician with many credits to his name. Mel, we’ve been discussing the distressing changes to our once-homey little berg quite a lot on the FB page NextDoor Winston Manor 1 & 3. Most of us have lived here for some time and are, no put it lightly, not happy! Thank you for summarizing in this piece exactly what’s distressing us all. I’ve copy-and-pasted the link to our page for all to read. Well done! Well, thanks to Mr. Ellison for sharing this with the community, I was not aware of the nature of the changes. Agonizing over a problem can be good if it leads to ORGANIZING. So what our we SSF residents going to do about it! I am marching to the same tune. 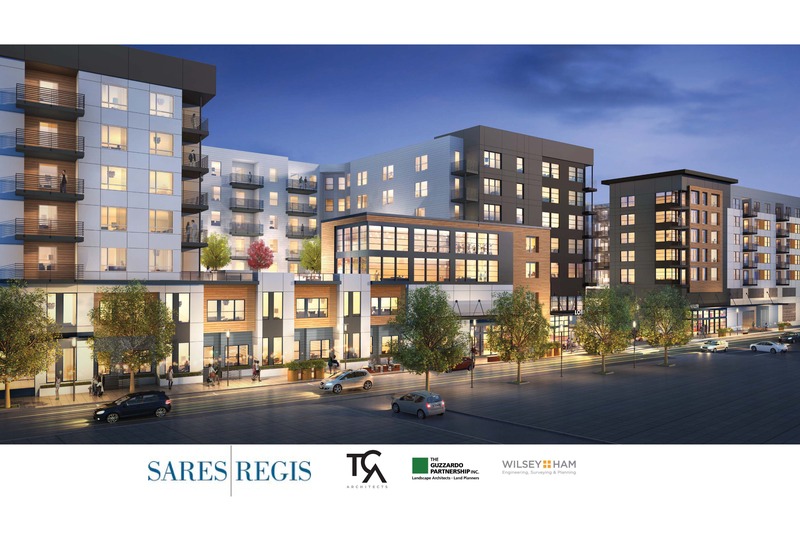 I worked diligently to let the Planning Commission and the City Council about the multiple problems Sares-Regent construction would engender (including the present and future project v. traffic issues, as well as dropping five hundred new residents into an already-crowded neighborhood while only providing two hundred new parking spaces). That fell on “deaf ears”. I’ve consistently pointed out the added residents will NOT pull their financial weight when comparing the added tax contributions to the additional city-services they’ll require. That shortfall is going to be the burden of existing taxpayers – like you and me. 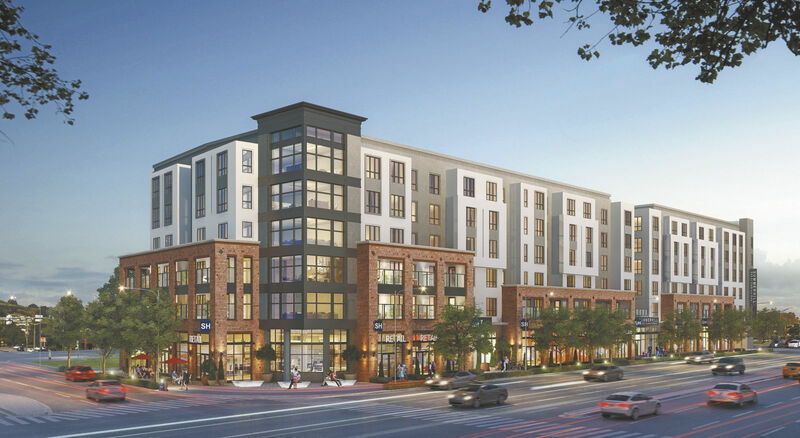 And – rewarding officials’ sense of self-importance – they’ve proposed a super-duper new Civic-center on the old nursery site off Chestnut at El Camino (but continue to let the lots behind Orange Park lie waste). Don and Rich are closing Bronsteins on Grand Avenue because keeping a business alive on Grand Avenue (that attracts customers from all over Northern California) has become unrewarding after 74 years. And a City Council that recently extended the terms of members without any voter approval is part of the problem. Council seats held by Addiego, Gupta, and Normandy are up for election this year; perhaps some serious challengers can be found. With regard to the traffic situation, I have submitted MANY TIMES to See-Click-Fix the fact that the striping on Hickey Blvd. between El Camino and Junipero Serra needed to be redone. 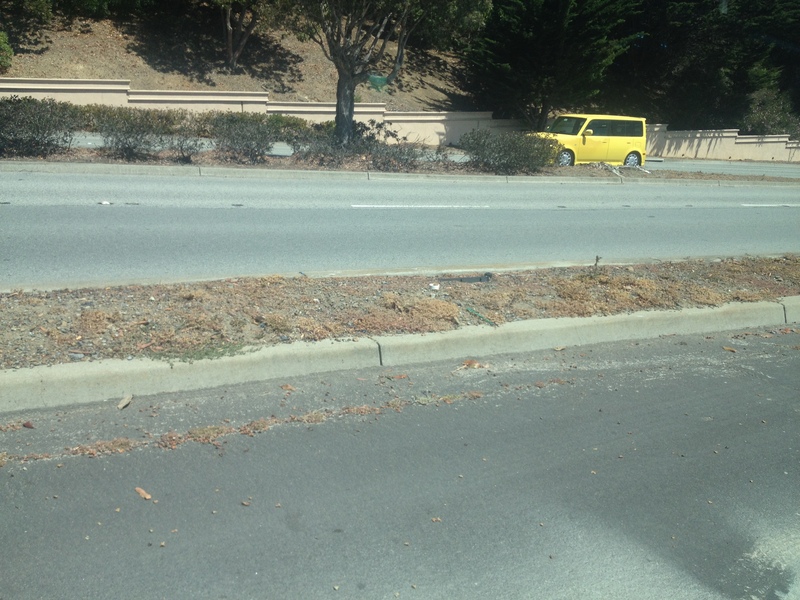 The median has no “bumps” surrounding it to alert drivers. At night, it is difficult to see the median, and in the rain, you can’t see the boundaries at all! They managed fairly recently to put down the yellow double lines on top of the remaining bumps, but did not use reflective paint! I have a 2001 Ford Taurus station wagon and neither my regular or bright lights illuminate the reflectors! 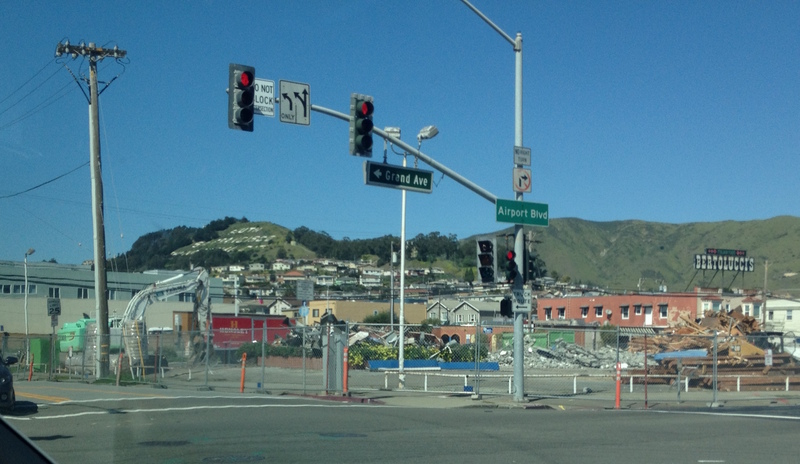 But, more recently, the city redid the two triangle areas at the junction of Hickey & Junipero Serra! Beautiful area! But still the road is bad! Thanks you for voicing what so many others are saying! Keep it up! Perhaps Kamala will again enter the fray. Perhaps others. Thank you for the fantastic article! Not only is the City Council becoming more blindsided by corporate institutions, but they have forgotten their purpose! SSF have invested in corporations and they have the financial means but, they have allowed their educational institutions to falter. Schools need more financial support for their staff and upgrading materials! We have a lot of senior citizens living in SSF, we don’t need a Bond measure every five years that raises our taxes when SSF can afford to pay! The senior citizens are barely surviving! Also, upgraded hospitals, the council picks and chooses, the hypocrisy of the City Council astounds me! SSF is one of the mor wealthier cities and I am proud to have been living here for close to 40 years! But, the decisions that have been made lately are puzzling! C’mon everyone. Where are you? Thank you for all the great comments and for helping to spread the article around! So many great ideas, thoughts and kind words….and David Crabbe’s article was spot on. There are three council seats up for grabs in the next election with only one candidate declared as of this writing. We need more people willing to step up to the challenge….people who understand that growth and change is necessary, but also have a sense of our local history and what has made this a great place to live and grow a family.